Changi Airport has long been a popular haunt for many Singaporeans, even if they're not flying off somewhere or welcoming someone home. 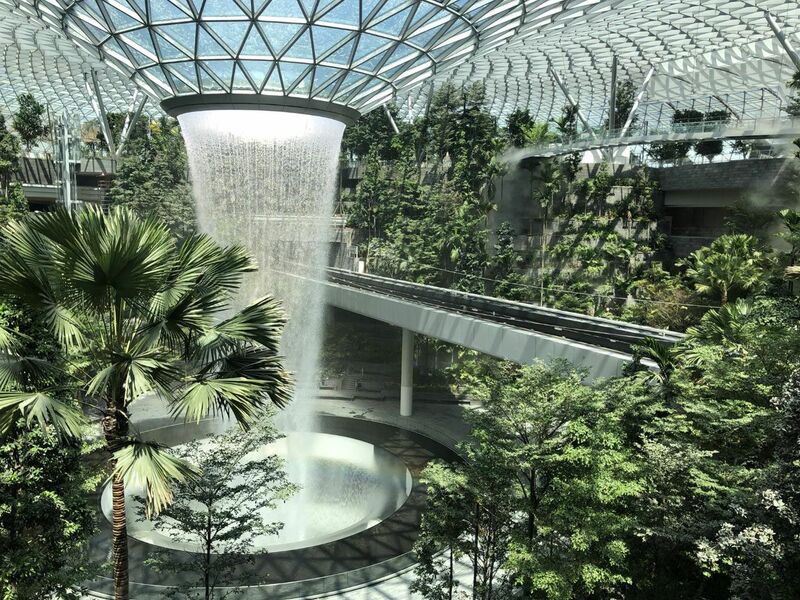 But come April 17, it'll be one of the hottest destinations for indulging in the nations' favourite pastimes—shopping and eating—when Jewel Changi Airport officially opens for business. Designed by renowned architect Moshe Safdie, the massive 137,000-sqm multi-dimensional lifestyle destination's dome-shaped, glass and steel structure is immediately impressive. And it’s even better inside, where the lush rainforest valley and its eye-catching 40m high rain vortex—the highest indoor waterfall in the world—take centre stage. Take your time to admire these man-made wonders, but make sure you give yourself time to shop (it’s home to the largest Nike store in Southeast Asia) and dine—there are more than 280 establishments to choose from. “We envisioned Jewel to be the place where ‘the world meets Singapore and Singapore meets the world’,” says Tan Mui Neo, head of leasing at Jewel, adding that 30 per cent of the mega-mall was allotted to their curated range of F&B offerings. It's quite a large space to fill, and several fresh imports are helping do just that. These include popular American burger joint Shake Shack (02-256), which is opening its first outlet in Singapore and serving its signature comfort foods, such as the ShackBurger, made with all-natural angus beef, Shack-cago which features the Vienna sausage, and freshly-made custard ice-cream. Remember A&W (B2-209)? It’s making a grand comeback after 15 years. Aside from its popular root beer float, diners can look forward to a Jewel-exclusive menu that includes best-selling items from around the world—the sinful A&W cream cheeseburger (Japan) and Golden Aroma chicken (Indonesia) included. And because we love having more to choose from, there's also London’s famed Burger & Lobster (05-203) to add to the list. It’s famous for its prime burger, which uses Nebraskan beef patties made more sinful with a topping of extra cheese, bacon and a secret sauce. Alternatively, opt for the lobster roll, which is essentially succulent crustacean meat sandwiched between fluffy brioche buns. Also hailing from Europe is Pink Fish (B1-261/262). While the brand's original outlet has shuttered, it’s set to make a splash this side of the world with a seafood-centric menu of healthy salads, wraps and poke bowls. Of course, it’s not only about burgers and fast foods. Chinese cuisine is well-represented, too, particularly at restaurants Xiao Bin Lou (02-208/209), which specialises in Chongqing cuisine, and Yu’s Kitchen (03-208), which serves ethnic Yunnan fare. Kam's Roast (02-210) is also opening its first outlet in an airport. Best of all, you can enjoy its signature roasts and cured sausages at the restaurant or purchase special travel packs to take on your flight. Shang Social (01-219-222), the first standalone restaurant of the Shangri-La Group, is also making Jewel its first home. It serves Cantonese, Huaiyang and Sichuan cuisines crafted by three of the group's master chefs: Mok Kit Keung (Shangri-La Hotel, Singapore), Zhou Xiaoyan (Shangri-La Hotel, Nanjing) and Rick Du (Shangri-La Hotel, Shenyang). Look forward to their signatures such as deep-fried whole boneless chicken filled with fried glutinous rice and mapo beancurd with minced beef. To be sure, Jewel Changi Airport located beside Terminal 1 also has travellers passing through covered; even those on a layover won't need to leave the vicinity to have a taste of signature Singaporean fare. Peranakan favourite Violet Oon Singapore's (01-205/206) largest outlet to date is a 350sqm space where visitors can enjoy specialities such as the dry laksa, beef rendang and satay, before heading to the boutique shop to grab food gifts—top recommendations include the gula melaka cake and pineapple tarts. Another notable name to set up shop here is Jumbo Seafood (03-202/203/204) and it will be serving its all-time faves, from the aptly named Heart Attack fried rice to the classic chilli crab. And even if you decide to have a Tiger beer with the meal, you could still consider checking out the brand's first concept store, dubbed the Tiger Street Lab (05-205), that carries seasonal brews exclusive to Jewel, as well as a wide range of classic beers paired with popular local street food snacks. Affirming Singapore's global mix of dining options is Peruvian cevicheria Tonito Latin American Kitchen (02-248), brought to you by the folks who gave the island its first cevicheria, Tono Cevicheria. Last but not least is El Fuego (02-216), a European concept by local Western chain Collin's that's in the process of applying for a halal certificate. What makes this special is that chef Koh Han Jie, the first Singaporean to win the prestigious Young Talent Escoffier Asia 2018 culinary competition, has crafted the sumptuous menu worth travelling for. If you can’t wait until April 17 to check Jewel Changi Airport out, you can sign up for the preview happening from April 11 to 16. Here’s where to register: jewelpreview.com. To check out the rest of the options, click here. This article was originally published on Singapore Tatler.